Aloha State Park is a popular Cheboygan area campground located only 22.2 miles from the facilities of Mackinaw Mill Creek Camping in Mackinaw City, MI. Situated on beautiful Mullett Lake, Aloha State Park offers camping at the center of the Inland Lakes Waterways. Campsites are available near the boat launch. Aloha State Park offers 285 campsites on 107 acres. Camping styles vary widely and many State Parks may not be a good fit for some campers. Aloha State Park varies in their accommodations, features and facilities compared to Mackinaw Mill Creek Camping, so we have gathered information on Aloha State Park and contrasted them with Mackinaw Mill Creek Camping. 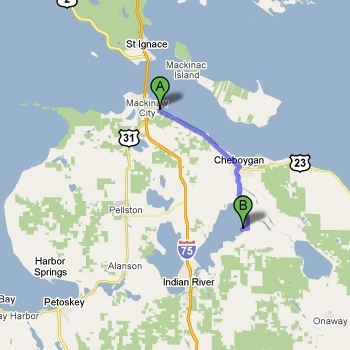 The chart below compares Aloha State Park versus Mackinaw Mill Creek Camping. Dozens of site types Aloha State Park offers 285 campsites, some with electrical service. Variety of Lakefront Cabin Rentals Aloha State Park does not offer cabin rentals. I reserved a campsite for my daughter for her stay a few weeks ago. I just wanted to say thank you for your hospitality, plus my daughter said that it was a beautiful campground and she enjoyed her stay there very much. She raved about your establishment so much that I am thinking of making reservations for myself next year! Anyway, I just wanted to thank you!